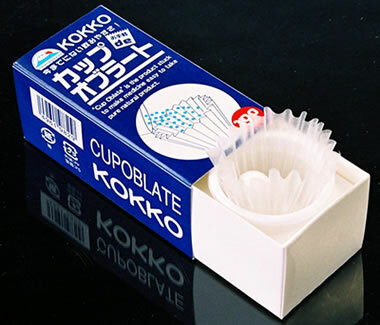 Cup wafer paper was created in Japan. It is even easier to use than other kinds of wafer paper. It is shaped like a cup with a larger mouth than the bag type wafer paper. It is easy to dispense medicine. 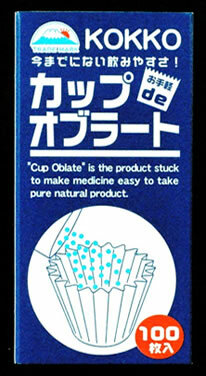 It is easy to take the wafer paper out of the package and simple to pour in the medicine. As seen in the photograph, a saucer is attached to the inner box of the package box so that a cup wafer paper is easily used. Like the bag wafer paper, both hands are to handle medicine. It is also portable for going out. As seen in the photograph, there is a saucer container attached to the inner box of the package. Cup type wafer paper is put into the container. The package becomes a stand and wafer paper is stabilized. It is easy to use.